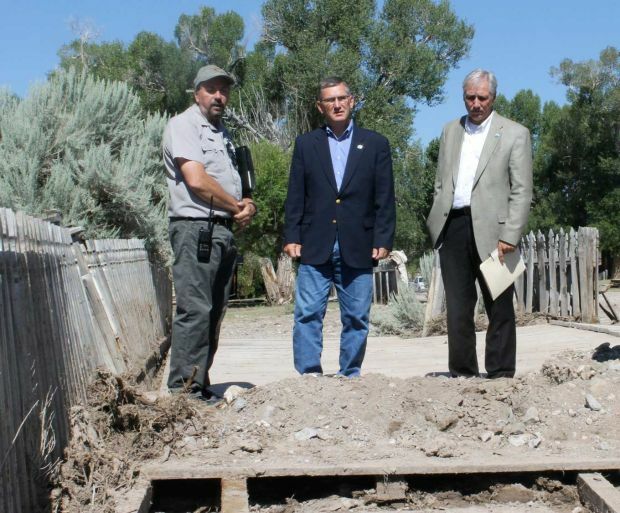 Inspecting the damage caused by flooding at Bannack State Park are, from left, park manager Dale Carlson, Lt. Gov. John Walsh, and Chas Van Genderen, administrator for Montana State Parks, pictured above on Monday. A flash flood on Wednesday left a trail of devastation in the state park 25 miles southwest of Dillon. This photo released by Montana State Parks Department shows flood water running down the main street of Bannack, Mont., on Wednesday, July 17, 2013. The flooding destroyed one building from the 1800s, washed out the town’s boardwalk and caused flooding damage to dozens of other properties. Bannack was Montana’s first territorial capital and is now a tourist attraction for people exploring the state’s gold rush past. The annual celebration Bannack Days scheduled for this weekend has been canceled and officials say the park has been closed until further notice. Sara Scott, cultural resources coordinator for Montana State Parks, standing Friday where the water surged down from Hangman's Gulch during the flash flood earlier this week at Bannack State Park. The storm damage to Bannack forced cancellation of this weekend's Bannack Days. Pictured is the floor of the Skinner Saloon caked in mud. More devastation can be seen in this shot of the Assay Office. 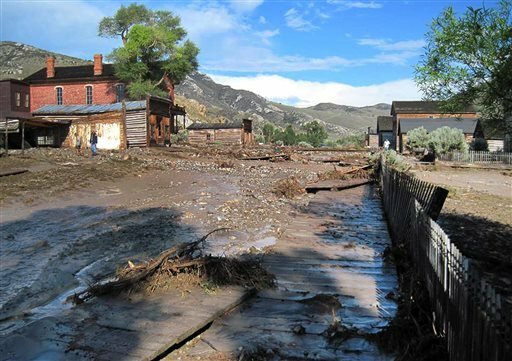 This photo provided by the Montana State Parks shows flood water running down the main street of Bannack, Mont. on Wednesday, July 17, 2013. The flooding destroyed one building from the 1800s, washed out the town’s boardwalk and caused flooding damage to dozens of other properties. Bannack was Montana’s first territorial capital and is now a tourist attraction for people exploring the state’s gold rush past. The annual celebration Bannack Days scheduled for this weekend has been canceled and officials say the park has been closed until further notice. BUTTE — Montana Lt. Gov. John Walsh surveyed the flash flood damage at Bannack State Park Monday, saying he is amazed by the devastation. And the 20 visitors stranded in the restored ghost town when the storm hit about 4 p.m. Wednesday? They were lucky to escape unscathed, he said. At the height of the flash flood, nearly three feet of water surged down Hangmen’s Gulch and through the center of town. It destroyed one building, the Assay Office, and tore away much of the boardwalk on both sides of the street. The park is expected to remain closed for at least a month as workers try to restore the town that first established in 1862. State park officials still have not put a dollar amount on the damage, but insurance is expected to cover a majority of the cost to return the town to its previous condition. Walsh said the state is ready to step in as well. “What the insurance doesn’t cover will more than likely come from the state,” Walsh said. Park manager Dale Carlson said more cleanup will have to be done before structural engineers can examine foundations, though he did say a handful of buildings have been prioritized in terms of their importance and the damage they received. Those buildings are mostly located in the center of town and include the Meade Hotel, City Drug, Turner House, Graves House, the post office and the jails. Carlson, who lives in Bannack, said the last few days have been hellish.